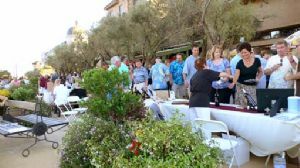 El Dorado County's finest wines, brews and cuisine brought out an appreciative crowd on a warm summer evening, June 12. Music accompanied the noshing, sipping and socializing into the moonlight. The annual event, co-sponsored by the Rotary Clubs of El Dorado Hills and Cameron Park, benefits local and international projects sponsored by the clubs.